Naturally dyed silk and organic sateens, linen and silk-cotton floss to inspire Spring-worthy stitching! I’ve got an added spring in my step because April is Earth Month (which originally began as Earth Day), and it also marks the beginning of my dye season! A Magnificent Bundle containing Essex yarn dyed linen, Brussels linen, vintage feedsack, organic cotton sateen and naturally dyed silk, plus 5 yards of hand dyed variegated silk-cotton floss! To kick things off, I’m having a gorgeous giveaway for two lucky winners! Freshly curated, “Magnificent Bundles” are now in the shop (have a look here). You can win a bundle for yourself and one for a friend! Click here for giveaway details. 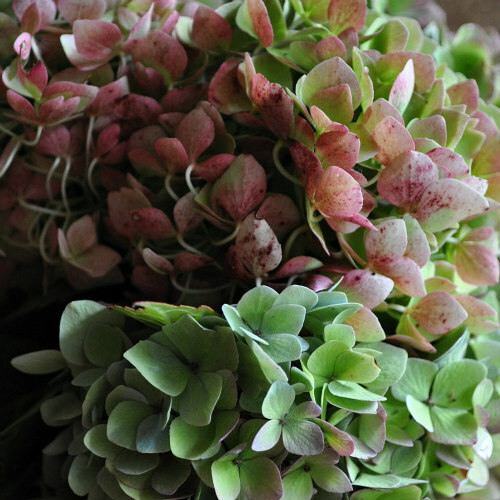 All of the bundles contain sumptuous linens, naturally dyed sateens and hand dyed linen or silk-cotton flosses. 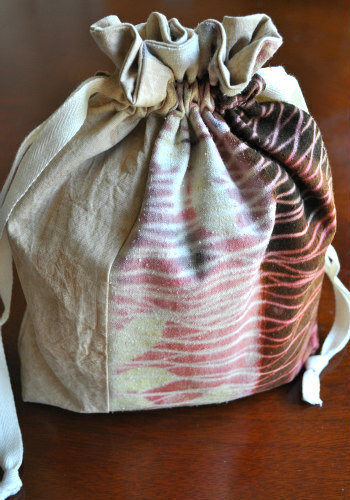 Some bundles include my hand dyed silk. I have such fun curating these bundles for your enjoyment! Those of us who love hand stitching appreciate an ample piece of linen. Every “Magnificent Bundle” is chock full of delicious, quality fabrics and they’re all just waiting for you and your needles! Have a look at these new bundles in the shop here. Each bundle is unique, and once they’re gone, they’re gone! Have a question? Kindly use the submission form on the contact page. 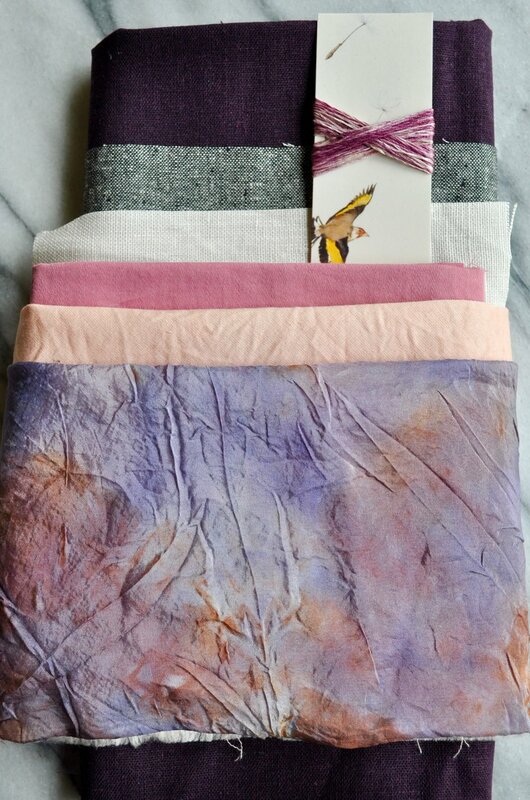 The “Magnificent Bundle” in the top photo contains linen, hand dyed silk and organic cotton sateen charm pack, plus 5 yards of variegated naturally dyed silk-cotton floss. Most of the bundles are wrapped with one yard of rare, vintage French ribbon from Marcia’s basement at Tinsel Trading! More good news?! Newsletter subscribers receive a limited time 10% discount shop wide! New subscribers will be emailed the discount code. Offer good through midnight Tuesday the 23rd. 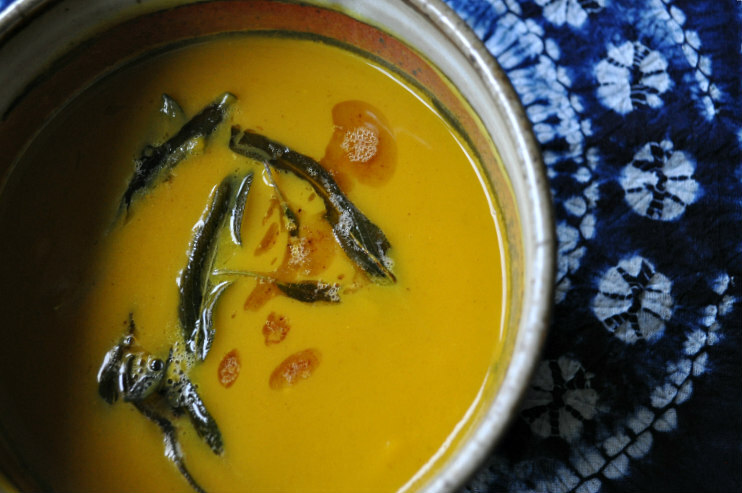 These days, having a few pre-portioned soups and casseroles in the freezer is a convenience I depend on. At the end of a busy day, reaching for a delicious and nourishing meal is very satisfying. This Chicken Pot Pie Soup is one of my recent favorites, and I skip the pie crust “crackers”. I’d love to hear your favorite freezer-ready meal in the comments below! As always, you can follow all the action with our new kitty, Franklin, plus close ups of studio life on Instagram. Say hello! Is This the Year Of the WIP? WIPs on trays for portability and easy access. Lately, I’ve felt compelled to finish my piles of WIPs before I have a chance to add even one more to their numbers. Today, I’m sharing helpful tools for organizing WIPs, and I’m inviting you to share your best tips for completion in the comments below. I’ve also made a place for us to share our WIPs and cheer each other to the finish line: #finishedwips2019. Join in the fun! If the sheer number of online quilters posing the challenge to finish their WIPs this year is any indication, this just might be the Year Of the WIP! We all have them, and I’ve seen some excellent organizing and planning tools. For printed pages to document and track your WIP progress, Patchwork Posse offers this free set. Also, there’s the Quilter’s Planner. (I’m not paid for endorsing these products, I just appreciate them and want to share.) You can also make your own chart to suit your needs. While I don’t use one, I have a feeling there’s probably an app for this, too! Here are four of my WIPs to tackle this year. I’ve made my own tracking page, and I’ve tacked it to my design wall so that it’s always in plain sight. I store my WIPs on trays, uncovered, on a bench in my studio. The portable trays are stored in the open within easy reach of the sewing machine or to take up to my hand sewing nest. I also store the spool(s) of thread, bobbin(s) and any instructions, notes and templates on each tray. It’s all about removing hurdles that could slow my progress. Any amount of success is going to depend on finding the right storage and organizing methods for you. For example, I know that if I cover my WIPs or store them under a bed, I’ll forget they even exist, let alone where I put them, so I know I need to see them. It’s the same reason why I tack up my progress chart on my design wall. It can’t get misplaced, and it’s in plain sight to remind me to make the most of my sewing time. My WIPS are a mix of techniques, and these four are my personal quilt projects rather than for my business. They have no deadline, and each was started because I was curious about the technique and the construction process. I like to have a project under way for each sewing method I enjoy, that way, what ever my mood or energy level there’s a project at the ready. I suppose that’s a double-edged sword. You can see that I have a few methods represented, including machine piecing, hand piecing and English Paper piecing. As far as how each quilt will be quilted, I’ve decided to wait and see what’s best for each as the tops are completed. My goal for steadily working on these is to try to sew for 30 minutes each morning before my day really gets under way, and then to sew for any amount of time on either Saturdays or Sundays. They say it takes 30 day for a new habit to become routine, so hopefully at the end of the month I’ll have some real progress to share. Having said that, life happens and I’m not going to beat myself up if any of these are still staring at me from across the room in December; however, in the spirit of the Year Of the WIP, newly organized and with a sewing plan in place, I’m committed to giving it my best shot! How about you? I’ll share my WIP journey here and on Instagram. Join in: #finishedwips2019! Before you go, in the comments below tell me how many WIPs you have, how you plan to tackle them or what stops you from working on them…after all, there’s safety in numbers! New Quilt Friends, a Winner and a Sale! I’m still enjoying the Instagram love being expressed for Karen Lewis’s new book, Wabi-Sabi Sewing! To check out the entire blog hop, visit Karen’s feed here. You’ll see lots of gorgeous items made by each of us on the book hop. On my day, I had a giveaway (photo above) and the lucky winner is: Mariana Galvagno from Spain!! You can check out her fun feed here: @cosertejercrear. Congratulations, Mariana! Charlotte’s photo of her Wabi-Sabi Sewing log cabin quilt in progress with matching pedi! One of my favorite aspects of running this small business is meeting fabric lovers all over the world. I recently had the pleasure of making a new quilting friend in Denmark, Charlotte @c_flintholm, who is already making great strides with the log cabin quilt from Karen’s book (as seen on the book’s cover, top photo). Learning that Karen used some of my fabrics in her quilt, Charlotte ordered several of my fat quarters (seen in the photo with her matching pedicure!) so that she could create a similar look. I think she’s doing a fantastic job and I’m looking forward to seeing it finished! 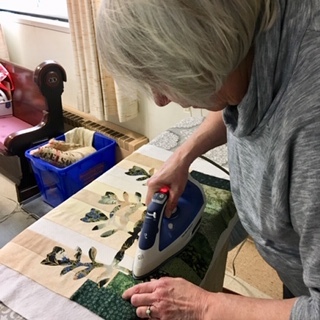 In this photo, Charlotte is sharing her quilting talent, but you also have to check out her incredible crochet work here! My Harvest quilt pattern with all the fall vibes! When I began this business a few short years ago I certainly didn’t imagine making quilting friends all over the world. The majority of my business is forged on Instagram, (another aspect I didn’t foresee,) and I’m grateful to each and every person who makes a purchase or says a kind word about my business, fabrics and patterns. Running a dye business takes a lot of work, and YOU are precisely why I do it! Your happiness matters to me, and is what drives my efforts to provide beautiful fabrics, share my knowledge and create fun opportunities to stitch! Friends, my annual Holiday Sale is quickly approaching! This year, the sale runs November 16th, 17th and 18th. Mark it on your calendar! If you’re new to my newsletter, you may not know that I have only two sales a year. I try hard to make it worth your while; to show my appreciation for your support and still honor the amount of work that goes in to producing high quality fabric, designing patterns and stitching up lovely gifts. So once again, prepare to treat yourself or loved ones and mark your calendars: November 16-18! See you then! As always, I love hearing your questions, comments, suggestions in the comments below or @tierneybarden. Thank you! 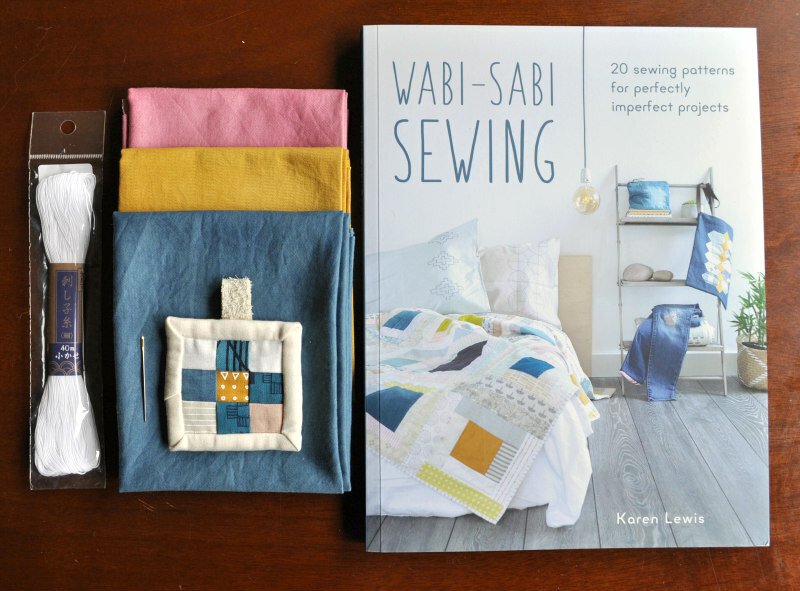 Have you seen my friend Karen Lewis’s newest book Wabi-Sabi Sewing? I’m so happy you’re here because today is my day on the fun-filled blog hop celebrating Karen’s gorgeous book! I’m thrilled to be in excellent company, and you can follow along and meet makers from around the globe by using #wabisabisewing or @karenlewistextiles. There are giveaways, insights into the book, reviews, beautiful examples of projects and much more, so don’t miss a day! To celebrate Karen’s book, I’m having a giveaway! For your chance to win, head over to @tierneybarden and play along - it’s easy! The star of the show, Karen’s own signature from one of her hand printed tulip panels. 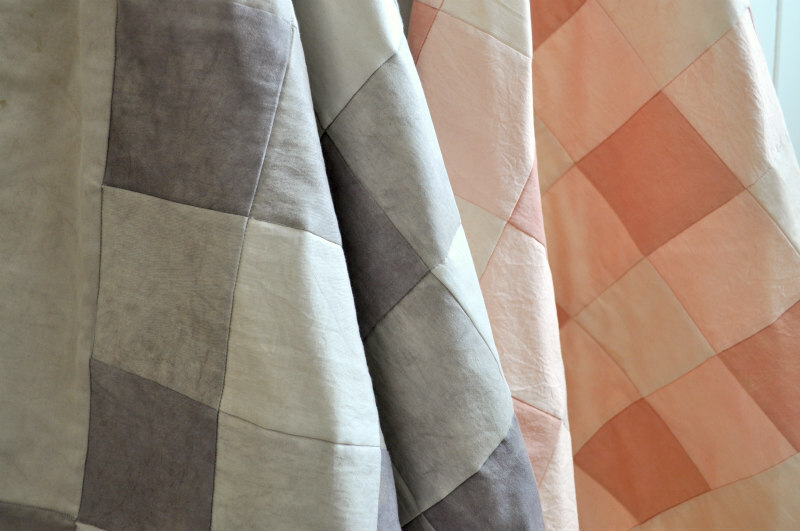 Fond of texture, Karen uses a variety of fabrics in her projects, from bark cloth and linen to her own hand printed fabrics, and I’m honored to say, my hand dyed fabrics. 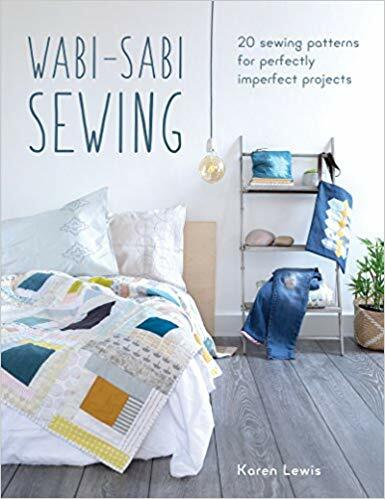 With categories like LIVING, EATING, EXPLORING and SLEEPING, Wabi-Sabi Sewing has something for everyone. Karen includes a wide range of techniques from quilting to embroidery to visible mending. You’ll find projects that use a few scraps and come together quickly, as well as projects that use a bit more fabric, the scrappier the better, and still come together quickly! The coziest spot in the house, all ready for fairy tales and day dreams. 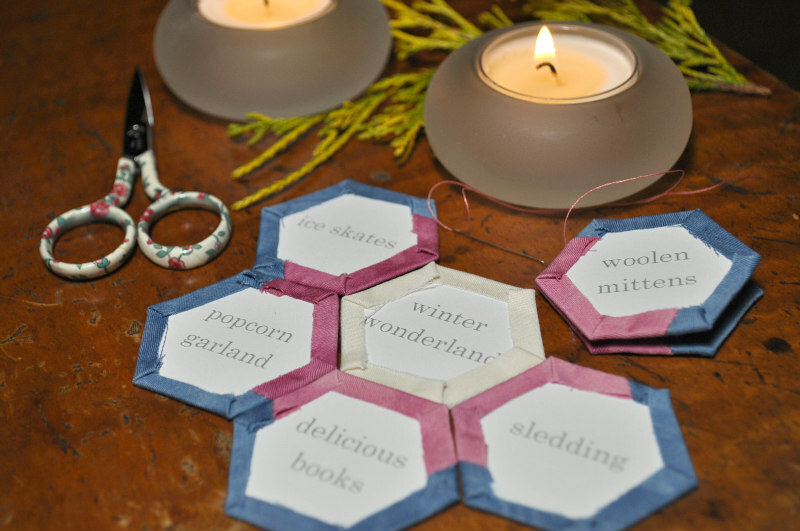 Every step of making this Hexagon Harmony pillow was fun! I chose big stitch hand quilting, just like Karen did, and it was my first time using sashiko thread and Tulip needles. Wow, they’re sharp needles, but what a difference they made stitching through the layers of fabric and wool batting. Karen’s instructions were straight forward and the entire project moved right along. I used a down pillow insert and am in love with the result! I’ve just updated my shop with freshly dyed fabrics and OOAK gift items. Have a look! Today is Friday, October 19th, and probably our last day in the upper 50’s, which means my indigo vat has one last round before hibernating for the winter. photo courtesy of Tracy Altieri. Fabrics are soaking, and the clock is ticking. I’m really looking forward to getting my hands in that big blue vat! If you’ve followed along on Instagram, you’ll have had a glimpse at an average dye day and how it moves from hour to hour throughout the day. Suffice it to say, with all of the dyeing these past few weeks, there will be a shop update very soon! These action photos were taken by my very talented friend Tracy Altieri, and you can find her gorgeous blog here and on Instagram @myretiringlife. On this particular dye day, Tracy swiftly captured me gingerly shaking out the fabric immediately upon exiting the vat. 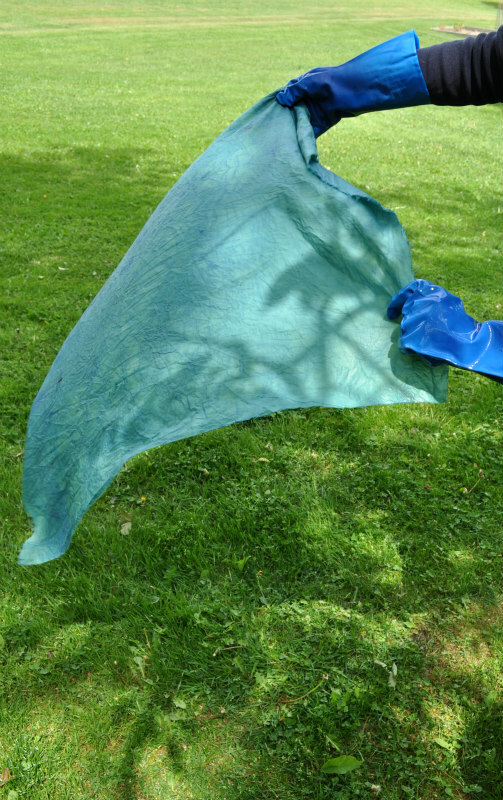 The fabric transitions from a yellow-green to blue-green and then to a majestic blue, as seen below. 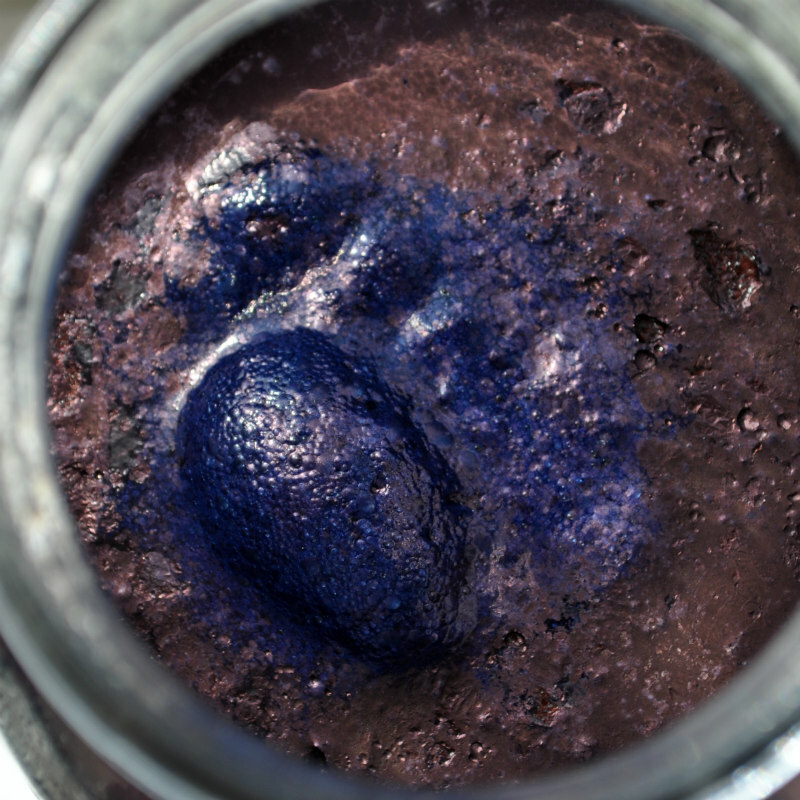 The blue deepens with each dip in the vat. This process never ceases to delight and impress! With that, I’m off to the vat, tick tock! Indigo dyed sateen drying among the dogwoods. A shop update is quickly approaching! Friday, October 26th is my day on the fun-filled blog hop for Karen Lewis’s chic new book, Wabi-Sabi Sewing! Meet the entire line up of talented, generous sewers and quilters on the blog hop which begins Wednesday, October 24th with Svetlana Sotak at http://www.sotakhandmade.blogspot.com. I’m thrilled to be a part of the blog hop celebrating Karen’s book. Follow along to see gorgeous examples several of us have made from the book. There will be giveaways, too, including one happening right here! You won’t want to miss it! A hidden clue for next week’s exciting post. Can you spot it? I hope this weekend brings you some of what you love most about fall! See you next week! 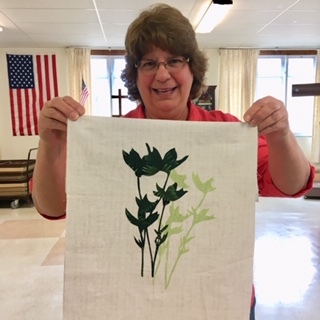 In 2016, I was selling my naturally dyed fabrics at the Squam Art Fair when the inimitable Jody Alexander stepped up to my table and purchased some of my fabrics. Lo and behold, a handful of months later, Jody published her first book, The Boro Aesthetic and graciously let me know that she used my fabrics in a few of the pieces featured in her book. Quite tickled, I've ordered my copy and can hardly wait to savor every delicious page! "Jody Alexander is an artist, bookbinder, librarian and teacher who lives and works in Santa Cruz, California. She binds books with found and discarded papers and fabric in a number of historical and modern binding styles, and rescues discarded books and gives them new life as scrolls, wall pieces and sculptural objects. Her pieces celebrate collecting, storytelling, and odd characters. Her characters, books, sculptural pieces and found items are often combined to create installations. She has taught book arts at San Francisco Center for the Book, The Center for the Book in New York City and University of California, Santa Cruz. Her work appears in a number of publications including Masters: Book Arts: Major Works by Leading Artist, 500 Handmade Books, and 1000 Artists' Books: Exploring the Book as Art. Jody is the 2015 recipient of the Rydell Visual Arts Fellowship." In addition to being a working artist and a librarian, Jody teaches workshops all over the world. I'd love to spend a day in her company, learning from her and seeing her work in person. 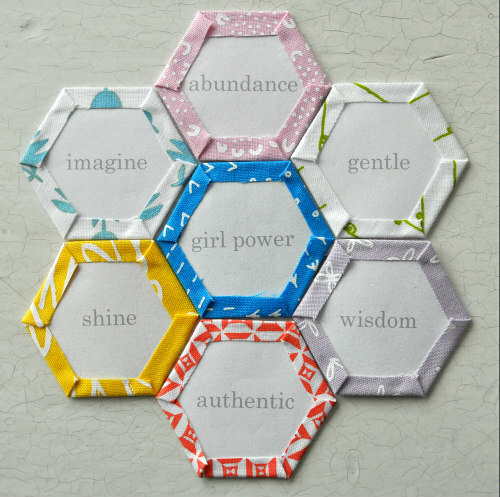 For those of us unable to make it to a workshop, Jody offers incredible online bookmaking classes at Creativebug! Now that our long hot spell in upstate NY has just broken, I'm ready to fire up the oven and try this delicious looking recipe from Ina Garten. It's her Crispy Mustard Roasted Chicken, and I'm looking forward to it this weekend! Do you have a favorite recipe you make the moment fall arrives? Tell me about it in the comments below - I'm on the hunt for new tasty meals! As always, I enjoy connecting with you, so please say hello on IG or in the comments below. Hot out of the oven zucchini bread with the very last lilies of the season. My one weakness is delicious food, and August puts me squarely in my happy place pickling, freezing, baking and cooking. Yesterday, I tried this zucchini bread recipe from Once Upon a Chef, and is in the photo above. It's moist and not too sweet, which allows the freshness of the zucchini to come through. The cinnamon is a nice touch, too. It only seems right to try Jennifer's double chocolate version next. Would you share in the comments your favorite recipe(s) to savor summer's bounty? I'd love to expand my list of must-makes. Books are my (other) one weakness, and I'm sharing some exciting news: my friend Karen Lewis has a new book, Wabi-Sabi Sewing, and it's hitting book stores and online shops now. I'm tickled pink that Karen used my naturally dyed sateens in some of her projects; for example, you can see my Gold, Teal and Indigo fabrics used in her gorgeous log cabin quilt on the book's cover. Anxiously awaiting my own copy, I'm eager to hold her book in my hands, pore over the spectacular projects she's been working on for many months and decide which one I'll make first. Karen's main focus for the book is to celebrate her love of seeing the human hand in both designing and making. Her initial love of quilting began by being drawn to the imperfect, preferring character over mass production, hence the book's title. Artfully combining hand stitching and tactile textures, Karen inspires us with 20 projects to discover and develop our own unique hand. Having worked with Karen for about a year and a half now, I can tell you she is one of the hardest working independent designers in the industry. I've stood in awe of what she accomplishes in a day, a week, a month. I'm convinced she doesn't sleep. Karen's wit, wisdom and warmth make working with her a pleasure. I only hope that one day I will actually get into one of her (always sold out) printmaking workshops. 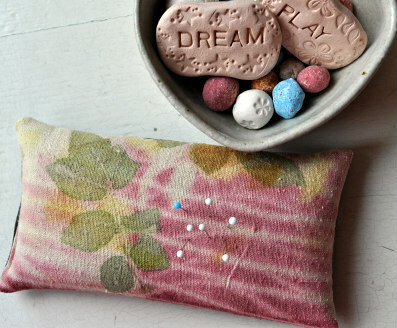 In case you were wondering, there is an upcoming blog hop for Wabi-Sabi Sewing, and I'm thrilled to be included. Stay tuned here and on IG for all the fun! To see more of Karen's hand printed fabrics, inspiring projects and world travels visit @karenlewistextiles. 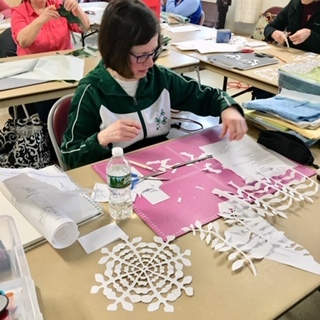 Welcome to the fourth installment of posts that explore the making of my art quilts recently shown at Squam Art Workshops. During the four days this show was up, I was genuinely touched by visitors' reactions and questions. Spontaneous, often dynamic conversations with small intimate groups or individuals helped shape this unique experience. Hands down, Metamorphosis and Self Portrait received the most inquiries and "likes", as it were. For the complete story about Metamorphosis, please click here. Read on to discover how Self Portrait came into being. For the complete view of "My Enchanted Wonderland" installation, please click here. Title: Self Portrait, 30.5" x 33.5"
To talk about Self Portrait without first acknowledging it's precursor, Metamorphosis, would be leaving out one half of the story. Metamorphosis was made in 2014 shortly after I decided to start a whole new chapter in my life. I was in my mid-forties and had recently faced a health scare (that thankfully came to nothing), during which time I found myself asking the big questions, primarily, have I done the things I want to do? My answer ultimately led me to the decision to put my financial affairs in order and allow myself the freedom to explore options for what could be next. Metamorphosis is about dreaming the dream and protecting that fragile, vulnerable space. You can read more about it in this post. About a year after Metamorphosis was completed, I felt compelled to stitch an update to that story. Four months had passed exploring possibilities, trying on various business ideas and adjusting to an evolving lifestyle, after which another six months were invested in getting my natural dye and quilt business up and running. All the while, I was gaining clarity and confidence about who I was becoming and the direction I was heading in. Going back to my college days earning my BFA at Alfred University, Joseph Scheer was a professor in the printmaking department. For a delightful trip down the rabbit hole, please visit his website here. His incredibly beautiful book, Night Visions: The Secret Designs of Moths, is highly coveted in my own art book collection, and it contains the moth I was drawn to for this quilt, Apantesis phalerata. Have you ever felt that inexplicable connection to something outside of yourself? Every time I opened Joseph's book to this moth, I felt a physical response - a sort of burning in my solar plexis - a connection. I had only felt that one other time, when I would stand before a particular painting by Lori Ellis, so I knew not to ignore this feeling. Click here to see Lori's incredible paintings. You know how moths hang on a screen with their wings spread wide, unmoving for long periods of time? Well, I thought if I were to hang in one place for such a large portion of my life, I'd want to hang on exquisitely patterned silk. So, moving ahead with a vision, I drew the moth on paper and cut it out. On a larger piece of paper, I drew a cartoon, a full scale ink drawing of the background damask pattern. I moved the moth around the cartoon until it landed where it looked most at home. Next, I traced the entire damask pattern onto clear plastic. Tracing shapes onto paper-backed fusible web. Next, I hand cut the pieces of just one damask unit. These became individual templates that I used to trace as many as were needed onto the paper side of fusible web already adhered to the back of hand dyed silk. These two steps are shown in the photos above. I cut each silk shape and referred to the cartoon as I arranged them on the shot silk background. Once the entire design was in place, I peeled the paper backing from each piece and fused them all into place with a dry hot iron. Essentially, by this point, I've handled each shape four to five times. With the background in place, I hand appliqued the moth. The forewings are reverse applique, silk on velvet. The hindwings are reverse applique, velvet on velvet, with hand dyed pink and red silk crepe de chine appliqued closer to the body. Two thin black velvet strips were cut for antennae. They were heavily machine stitched, which frayed the edges and created an ideal texture. The final step for the moth was to lightly stuff the body from the back before hand embroidering hair to resemble her real life Lepidoptera specimen. Needing a little life breathed into it, the moth's head, thorax and abdomen received light stuffing before hand embroidery. The next stage in the making of this art quilt was the free-motion quilting that covers the entire background. 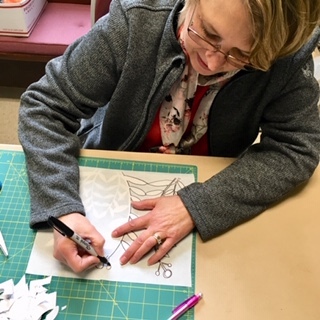 I didn't have a design planned out, instead, I brought the quilt to the machine and simply decided to start by outlining the damask pattern with red thread, defining shapes and filling in details like individual leaves and small flowers. Next, I moved on to stitching groups of small and large circles with a variegated thread in warm earth tones. The circles were also a way to connect to the moth eye spots in Metamorphosis. Metamorphosis and Self Portrait side by side in the cozy Deephaven Library, 2018. While Metamorphosis is about creating a safe place to dream the dream, Self Portrait is a celebration of shedding the cocoon. When this piece was finished I felt like I was looking in the mirror and this is what was looking back. As always, please share your questions and comments below or by email: tierneybarden@gmail.com. I'm grateful, and I read them all. You can also follow my natural dye works and daily life on Instagram @tierneybarden. 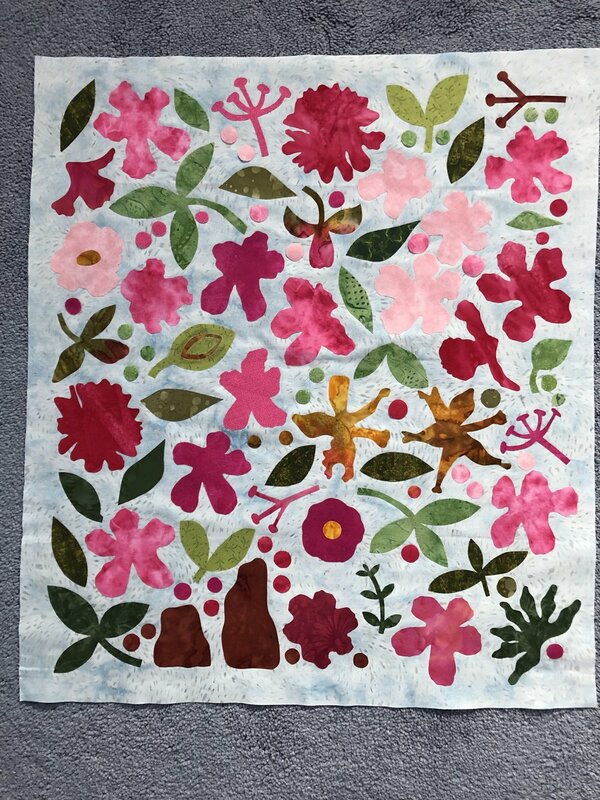 Welcome to the third of four posts that look deeper into the making of my art quilts recently shown at Squam Art Workshops. Dark Night has many layers, both physical and metaphorical, so enjoy this rare peek behind the curtain. For the complete view of "My Enchanted Wonderland" installation, please click here. Title: Dark Night, 33.5" x 39"
American Folk Art quilt, artist unknown, 1825-1845. Wool, silk, cotton, applique, beading and embroidery. Photo by Gavin Ashworth for the American Folk Art Museum. Smitten with American Folk Art quilts, like the example shown at left, I've long wanted to make my own quilt that tells a story with hand applique figures sprinkled all over the surface. Antique folk art quilts commonly illustrated daily life on the farm, politics of the day or biblical stories; however, my quilt tells a tale that transcends time and place. The title of this quilt is a nod to a specific step of the Hero's Journey as defined by Joseph Campbell: the dark night of the soul. Making this quilt provided plenty of time to really consider what it is to be on a quest through our own dark night - the battles we fight, the choices we make along the way, whether we hold fast to our values and beliefs or perhaps discover things about ourselves that change how we see the world and ourselves. My quilt's overall design became a treasure hunt, a search for meaning, sign posts and messages that help light the way through the darkness. As I mentioned, this quilt has many layers, one of which is the actual making of it. Imagine that it's February in upstate NY. Cold winds whip around the house, the days are more dark than light and temperatures hover in the teens. 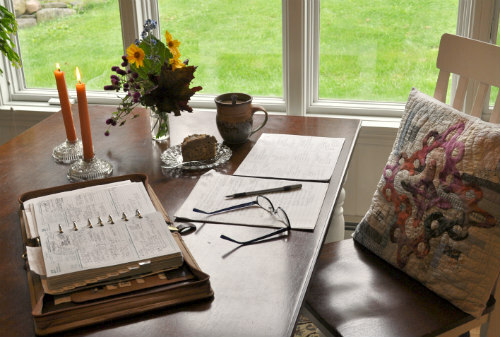 I'm safe in my Nest, burrowed beneath layers of downy softness, warmth and comfort, busily stitching by hand. On my right is an aged wooden bowl that holds my favorite tools and threads. Hot coffee on my night stand at 6:00AM, and by 7:00PM a fresh cup of fennel tea and a small piece of chocolate. I tell myself I've earned it, stitching by hand for 12 hours. The next day, wake up and repeat, and still with a happy heart. I realize this is the work I was meant to do. These are the stories I was meant to tell. The background of this quilt is the traditional Flowering Snowball block. I chose that block because, like life, everything is connected. I also like how the geometry of the pattern blends both feminine and masculine energies. From around the studio I thoughtfully pulled a wide variety of fabrics, including men's dress shirts, Japanese wovens and some commercial cottons. The fabrics had to relate to the story being told, for example, a bit of black lace suggests grieving, loss, pain, sorrow, feminine energy, etc.. Where there's shadow there is light, so fabrics that brought in light were equally important, hence the gorgeous rose-gold shot silk. Including some of my dad's ties made this quilt very personal. My dad passed away of a heart attack at age 59. I was 29. This sudden and tragic loss was my first quest into my own dark night. 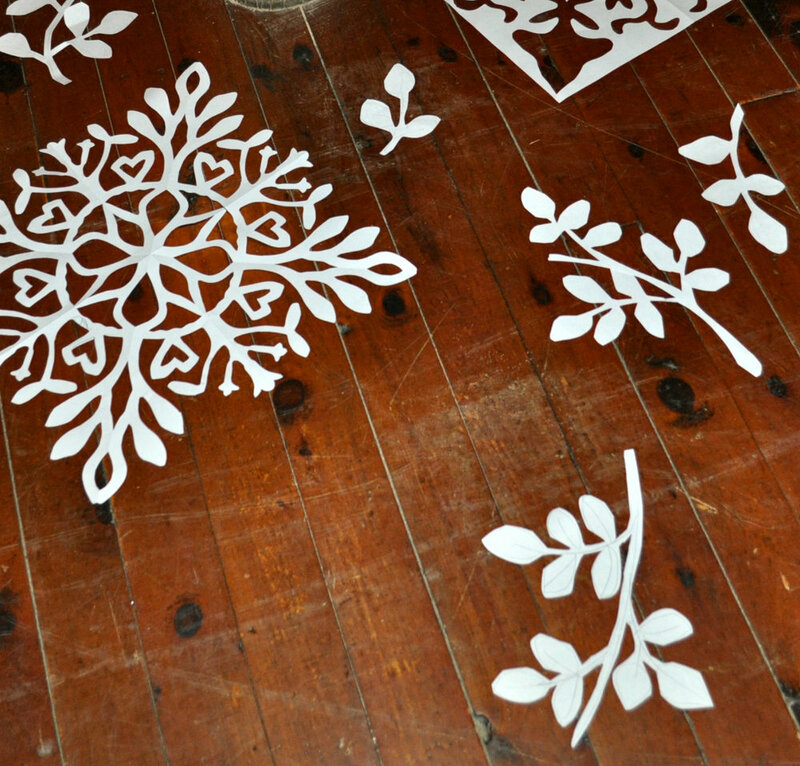 As rough as they are, I made my Flowering Snowball templates by hand and they worked like a charm. The test block shown here later became part of a pillow I made for Terri Dautcher who was indispensable helping me hang this show. The background all laid out before machine piecing it together. At this stage, I had only a basic idea of what the rose-gold silk applique might look. Scattered on the floor of My Enchanted Wonderland installation were some of the actual cut paper rose stems used in the making of Dark Night. 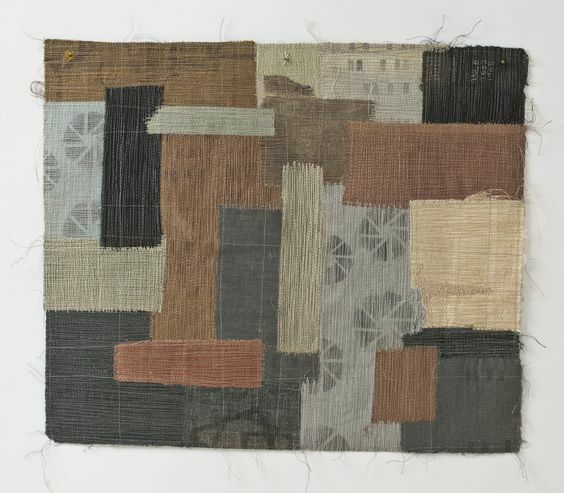 For this quilt, loose paper cut shapes helped determine the composition before the final shapes were cut from silk. Hand stitching silk shantung is an indulgence I'd afford again and again. Stitching shantung into a garment is one thing, needle turn applique is another. Once I understood this fabric's tendency to fray, the nature of the weave upon turning under, and the presence of slubs, the process actually became enjoyable and I found myself drawing somewhat intricate shapes like the key, the ladder and the swan. The entire composition actually evolved over weeks of stitching, adding more paper shapes, then more stitching and more paper shapes. As I stitched, I'd connect a few more dots about dark versus light, or fighting the good fight, and another symbol would appear in my mind's eye. Gradually, all of the quilt's symbols revealed themselves. Looking back on the process, it was a good lesson in staying open and in the flow. One of the reasons I'm partial to antique folk art quilts is their inherent wonkiness. Confronting my Type-A personality, I intentionally made myself loosen up when drawing and cutting each and every paper shape. I stopped myself from "fixing" this curve or that petal. I have to say that those wonky shapes were a joy to applique. It's funny to me that when I teach, I readily encourage students to embrace imperfection, to celebrate it, and there I was, reminding myself to do as I say. For me, those mis-shapen, odd-looking shapes breathe life into the piece. They add character and personality. The way I see it, evidence of the human hand is a gift, a little piece of the maker left behind for the viewer to discover, to take delight in and even to bond with the maker - to say, "Yes, I'm human, too." I'll have more of that, please. I hand basted this quilt before taking it to the machine for free motion quilting. First day of machine quilting. Two full days, total. This handsome piece of Jo Morton fabric was perfect for the quilt backing and binding. One layer of wool batting was enough to create a sculptural quality on the back. Dark Night is suspended over my Nest in the cozy Deephaven Library, 2018. Artists are often asked, "How do you know when a piece is finished?" For me, there simply comes a moment when I notice a silence in me, a stillness that says, "No more is needed. I've said all I need to say." In my Nest. Photo courtesy of Amy Gretchen. 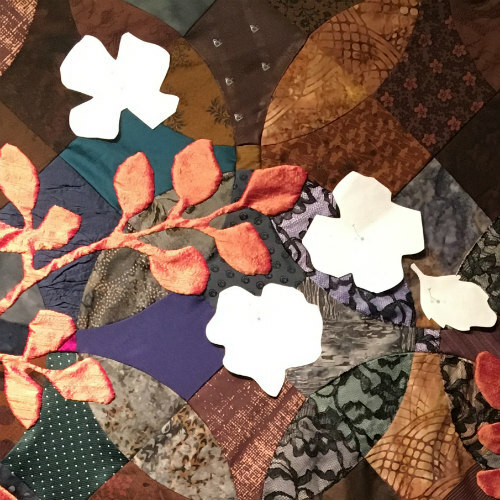 Welcome to the second installment of posts that look deeper into the making of my art quilts recently shown at Squam Art Workshops. 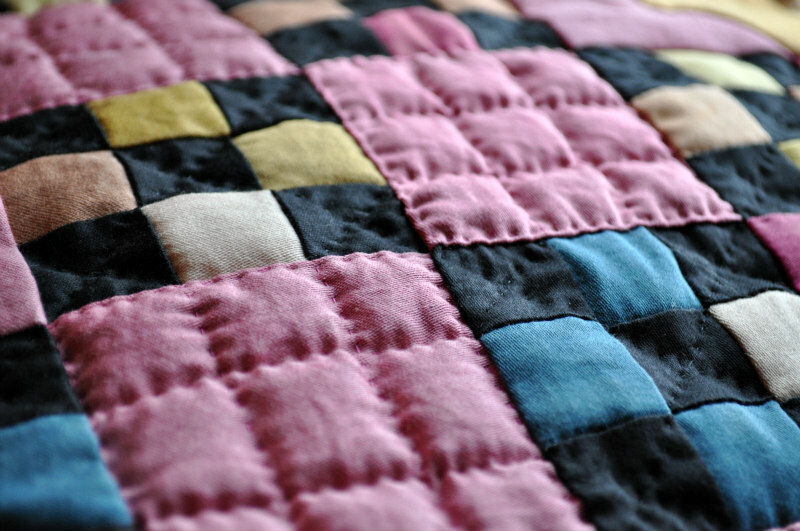 This quilt is titled New York Beauty and is a dynamic example of what can happen when curiosity and spontaneity collide. For the complete view of "My Enchanted Wonderland" installation, please click here. Title: New York Beauty, 34" x 32.5"
One wintry afternoon, diligently stitching along on some of the other quilts in this collection, I went into the studio in search of something and found myself rifling through a drawer only to come across a stack of envelopes with my grandfather's hand writing. Perhaps I should have left those letters for another day and gotten back to my stitching, but instead I chose to stand in silence and open each envelope, unfold each letter and read all of my grandfather's words. The memories! My heart was both happy and aching at the same time. Missing them all. The bottom of every letter was signed, "All our love, Grandma and Parpar". I knew then and there that a quilt had to be made to celebrate these letters. I do a lot of looking at antique quilts and the ones that always hold my attention are wonky with a clear presence of the human hand. Early stages of building NYB, nestled in the Nest. 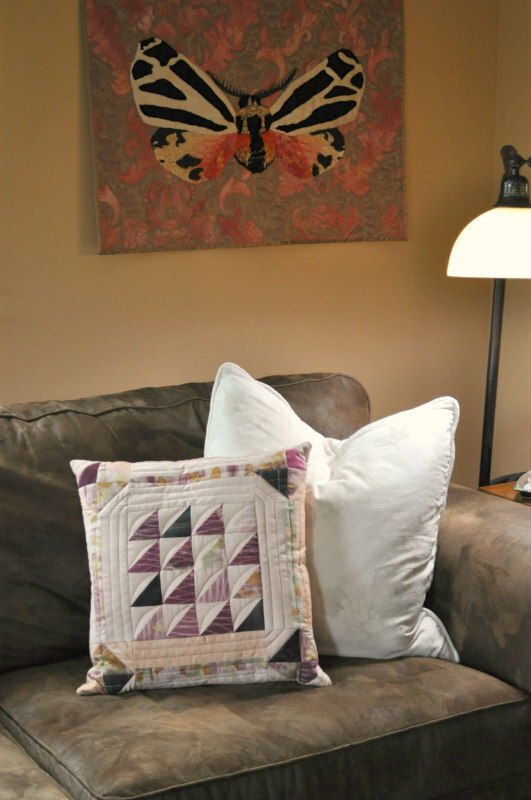 New York Beauty (NYB) is a classic quilt block that dates back to the early 1900's, and was a way of using up very small fabric scraps that would otherwise be considered unusable. 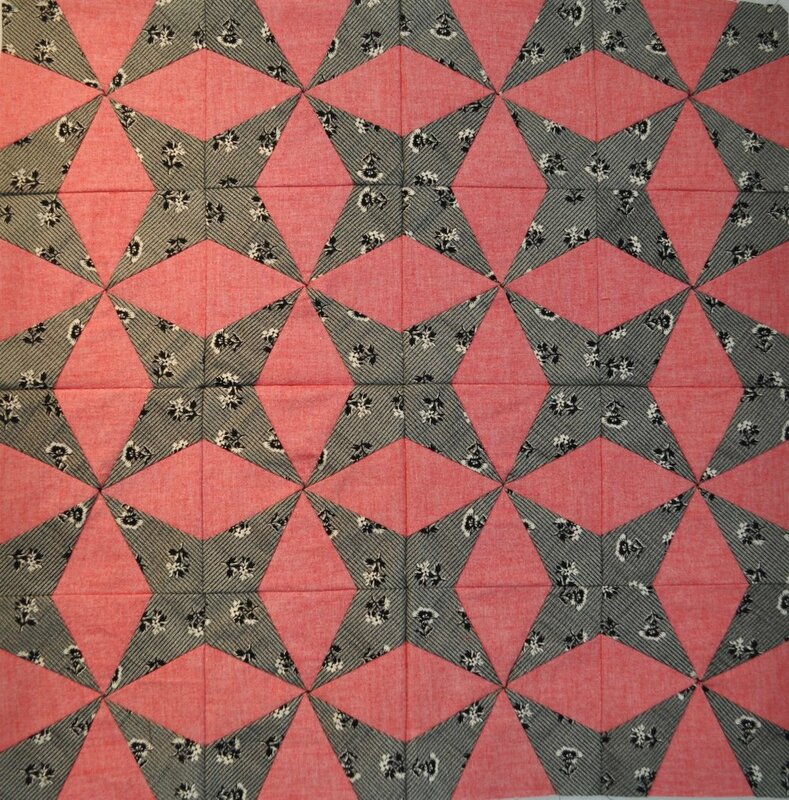 Because of its construction, the block earned quilters ample bragging rights. 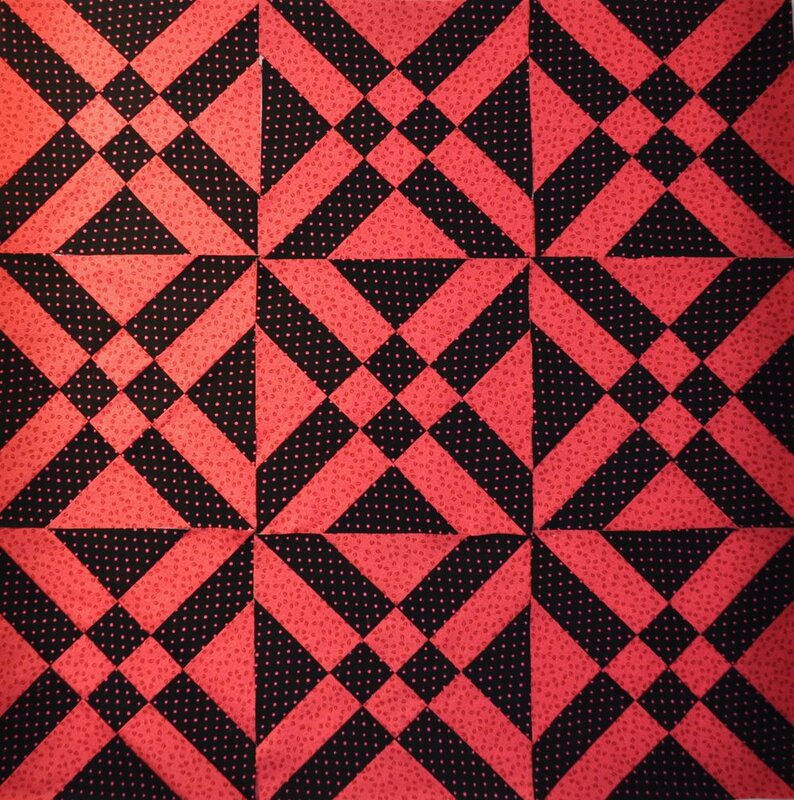 When I began quilting, I remember seeing NYB quilts and thinking, "If I could make that some day...." In February, I sat down and taught myself how this block works. All of the triangles in my quilt are hand pieced, and thanks to my friend Marion's guidance, I was able to advance from straight rows to curves. Steadily stitching peaches and pinks to lovely grays and deep blues became a soothing way to sail through several days of winter in upstate NY. At this same time, I was looking at an older drawing I had made of a plant out in the yard. Its spiky nature seemed to mimic the traditional NYB block, so I used it for the needle turn applique design in the center panel. I may never learn the plant's name, but we've both been growing alongside each other in our natural habitat. Like so many of us, much of the joy I experience with each art quilt is selecting fabrics and colors. Quite often, the core palette presents itself to me, I see it in my mind's eye, and then my job is to make sure all of the supporting players do exactly that. If I had to choose, I'd say that's my favorite way to build a quilt because I can get to the rest of the process much sooner than if I'm deciding on the entire palette (so many choices!). 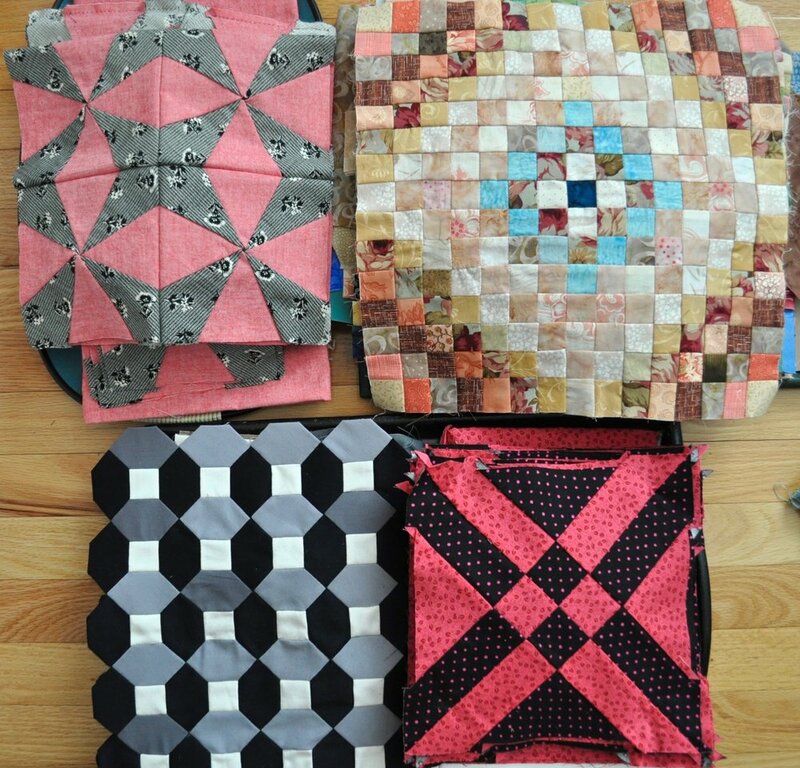 I often marvel at other quilters' color choices, and I know I'm not alone with my affinity for antique quilt palettes! For me, the study of color is a lifelong pursuit, and this I truly believe: color is a language unique to each of us and spoken by all of us. This is the first in a series of mini talks about my process making some of the art quilts shown in "My Enchanted Wonderland". 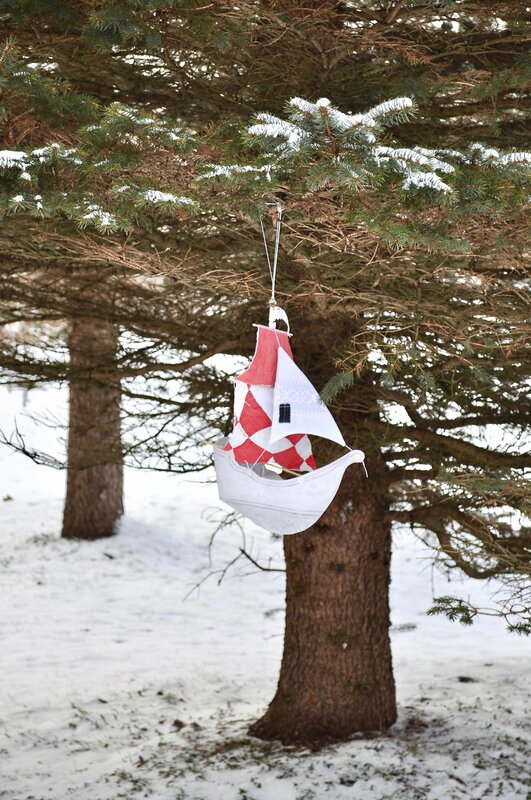 Reading this post will transport you back to that marvelous show in the woods of New Hampshire. 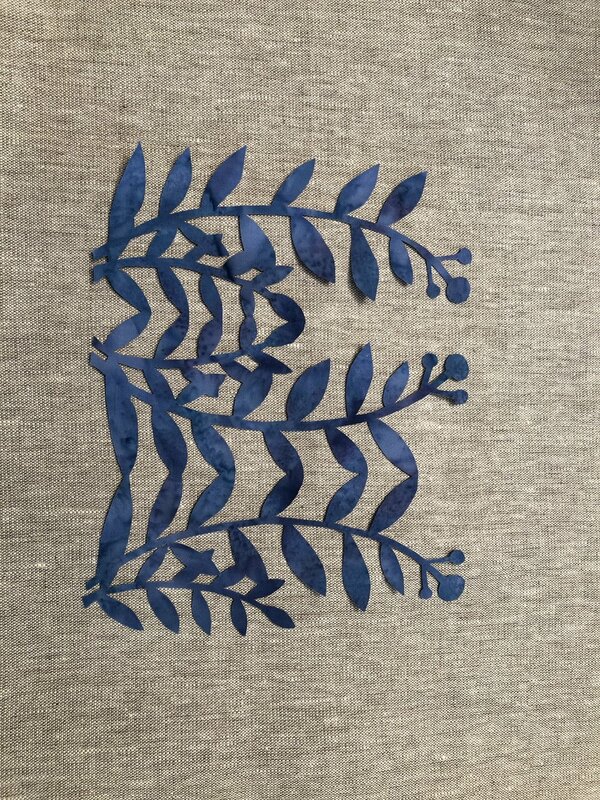 The star of this piece, the botanical applique, measures over 3'0" in height and is cut from one piece of cloth. I cannot tell you how many cozy winter hours were spent stitching it in place, but I can tell you they were glorious, for this piece marked a turning away from shame and embarrassment toward a place of acceptance, empowerment and love. This plant and I are friends, as it greets me on my summer walks. It grows in the shade of a much larger tree and the silhouette always catches my attention. When I drew it, I had no idea where it would take me, and what a journey! Love of nature, love of self. The making of this piece began with the central hand applique panel, (detail above), followed by the frame of triangles. It was at this point that the piece hung on my wall, unclear how to move forward. Weeks later, it came to me that just one final border was needed, and it should be fairly deep, with some movement and a kind of glow to it. Have you ever faced a deadline and known that the only way forward is the most involved, labor-intensive and meticulous process? Well, I chose one inch squares, individually cut and sewn. 1,408 squares of sumptuous color. While it seems a daunting number now, those days in the studio were so much fun and saturated with color that I hardly realized the quantity of squares I was sewing together! My Instagram feed is a nice place to see more of my process making this border, showing how I laid out values and made beautiful color combinations: @tierneybarden. As the quilt was nearing the finish line, one of the final touches was hand quilting the feathers. I had long wanted to give hand quilting a try, and this was my chance to dip my toe in the water. First, I marked the feather stencil (purchased from local Mennonites), with a water soluble marking pen. For three of the feather circles, I used Valdani variegated perle cotton, size 12 (detail photo), and for the large feather circle, DMC metallic copper floss. Quilting through two layers of wool batting was a dream, and the loft was just right to show off the hand work. The final element of this quilt's story is an ugly duckling/swan hand embroidered on the main panel. A small piece of my eco-dyed silk was used to accent the swan's head. When I was working on this part of the story, I was thinking of one of my idols, Hans Christian Andersen. If you haven't read his tale, The Ugly Duckling, give it a go this weekend. It's a good one at any age. As always, I enjoy your feedback and welcome conversation at tierneybarden@gmail.com, @tierneybarden on Instagram, or right here in the comments below.